2. 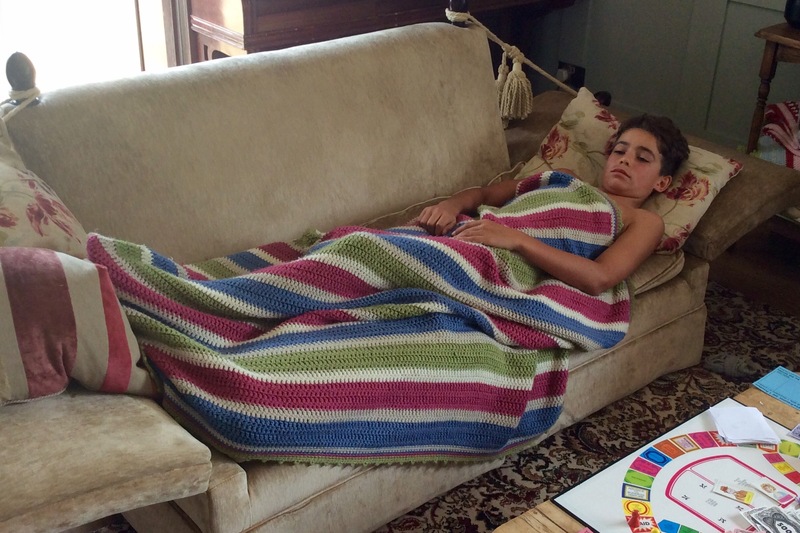 Unfortunately, both little boys came down with a sickness bug for the best part of that week and spent a large portion of that time flat out on the sofa. 3. In between bouts of throwing up, there were a few times when they perked up enough to indulge in a board game. This one was picked up for a pound in a church fair and was a favourite of mine when I was their age. The Boys soon decided it was their new favourite game, too. 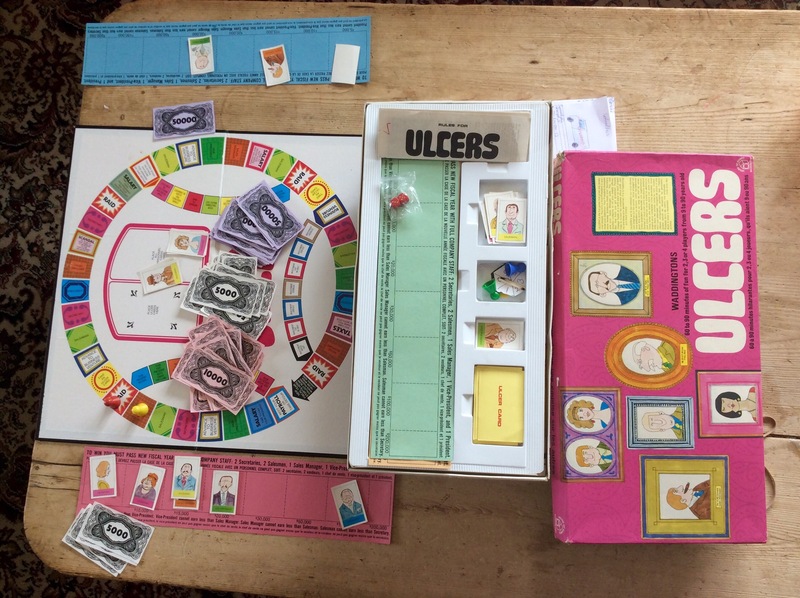 Does anyone else remember ‘Ulcers’? 4. 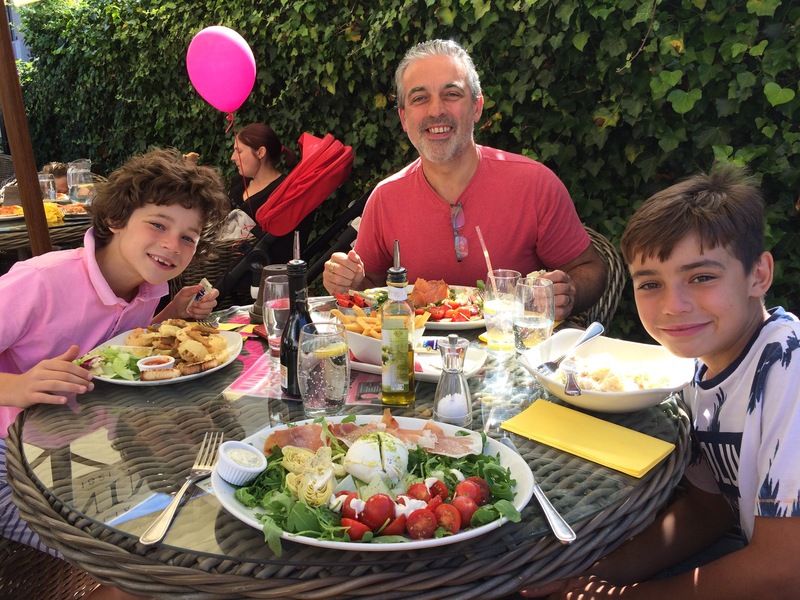 We took The Boys shopping for school shoes and had our last lunch out of the Summer holidays. 5. 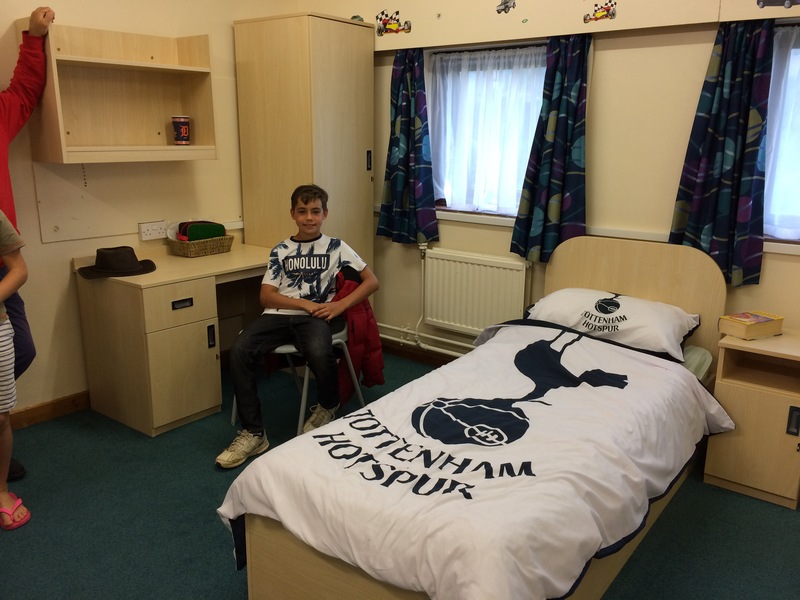 The next day we took No.2 Son to his new school – here he is in his part of the dorm with the obligatory football team duvet set. 6. 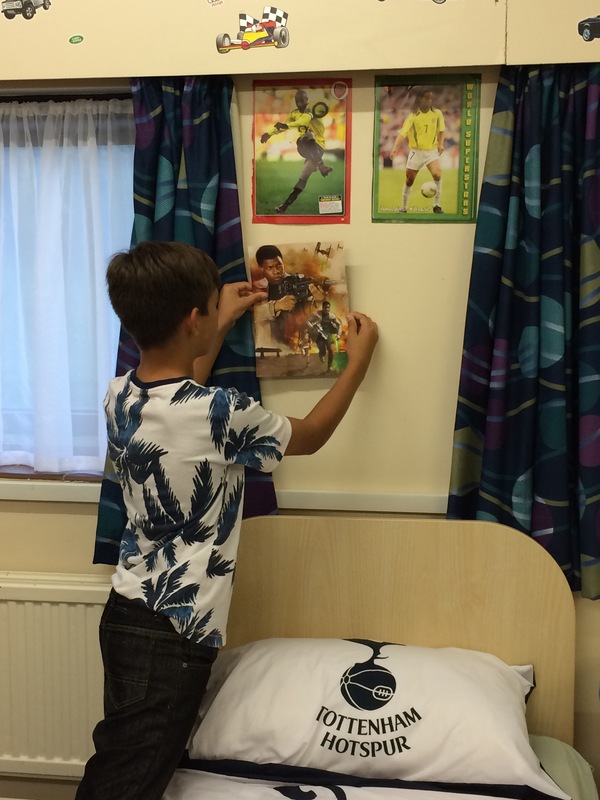 He soon made himself at home, putting up posters above his bed. We haven’t seen home in two weeks now and, as we decided not to give him a mobile ‘phone, have only spoken to him twice. 7. I took a good friend out for coffee to Kilver Court as she can’t drive due to an ankle injury. 8. 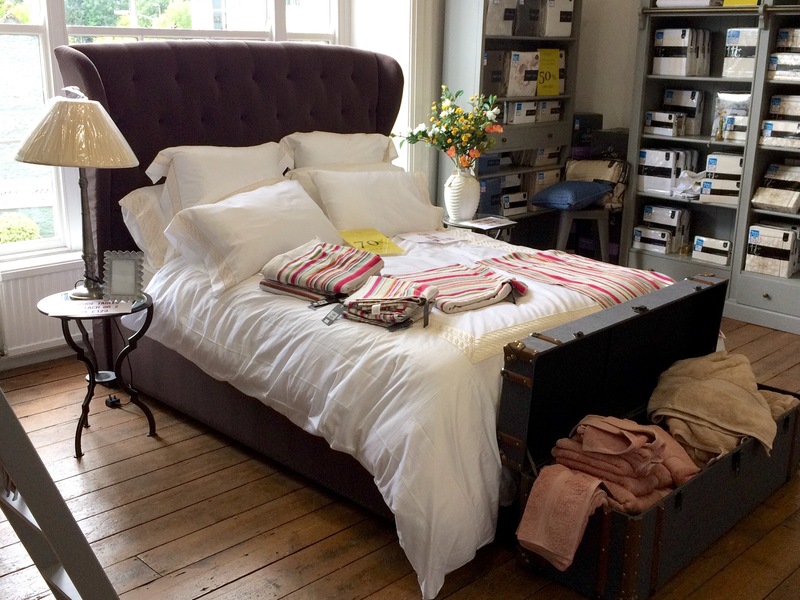 In the shop there was this ex-display Kingsize bed for sale for the rock bottom price of £400 including the mattress. My friend snapped it up! 9. Hubby and I popped out to a pub for a Persian meal. I drank two bottles of wine on my own. 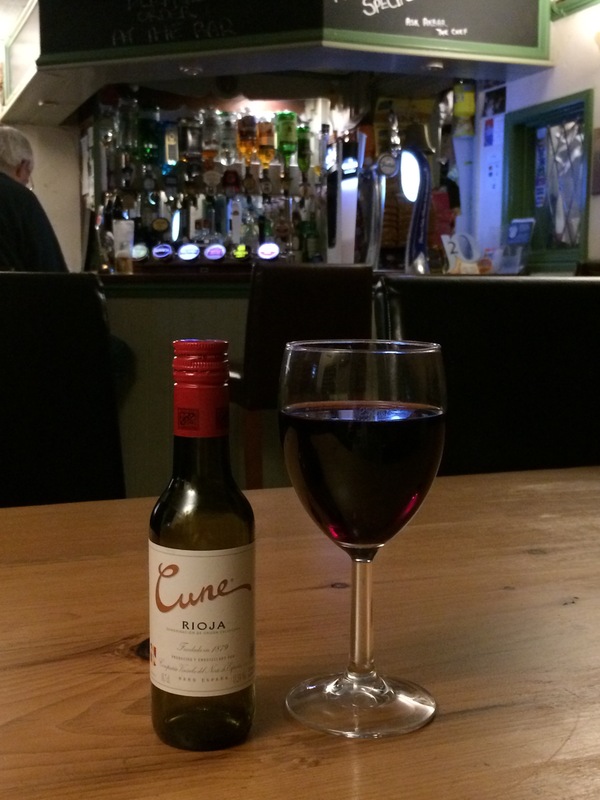 No, I’m not an alcoholic – they were tiny bottles. 10. I made ten jars of my favourite Damson Jam. 11. 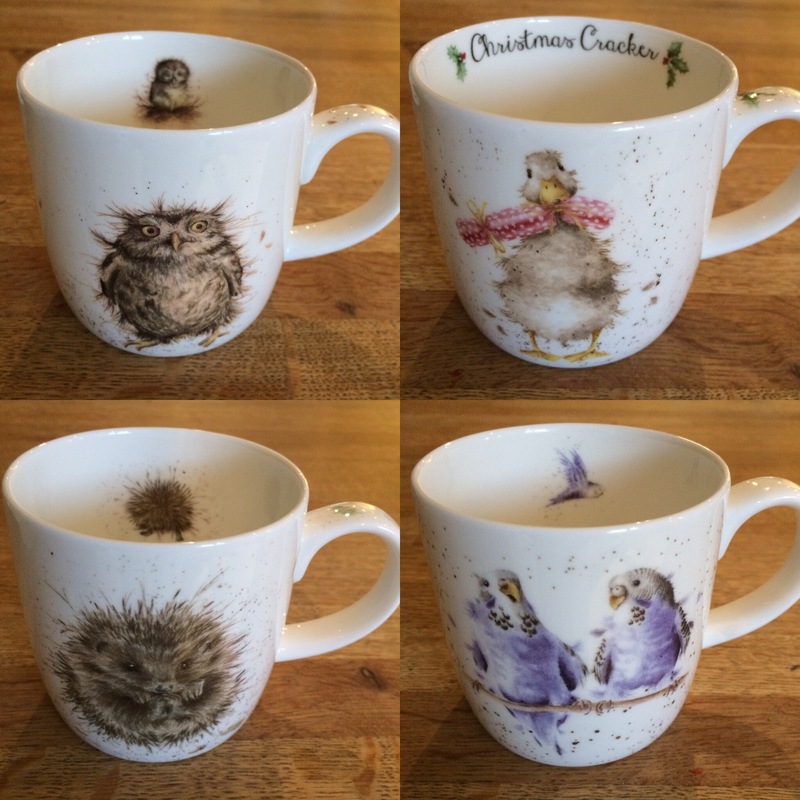 Hannah Dale’s gorgeous mugs by Wrendale Designs were on offer locally, so I treated myself to four more. 12. 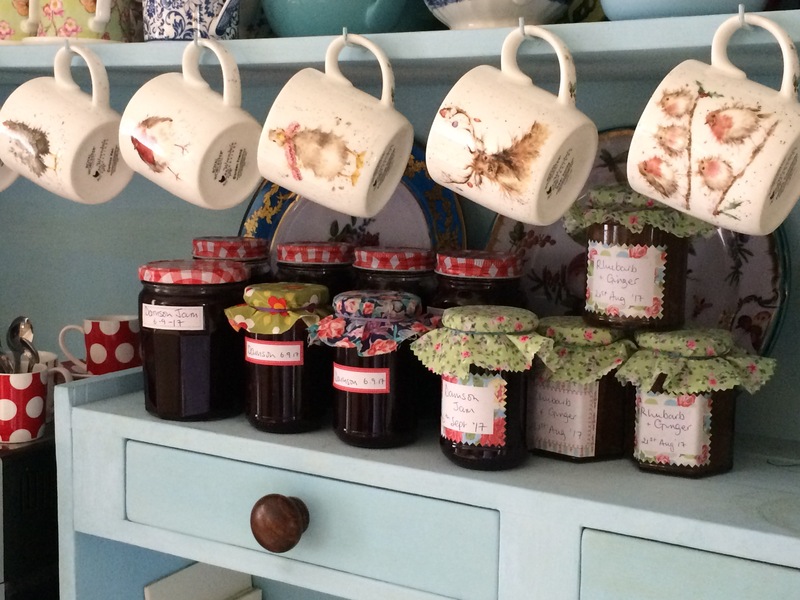 Together with the jars of homemade jam, they look lovely on my kitchen dresser. 13. 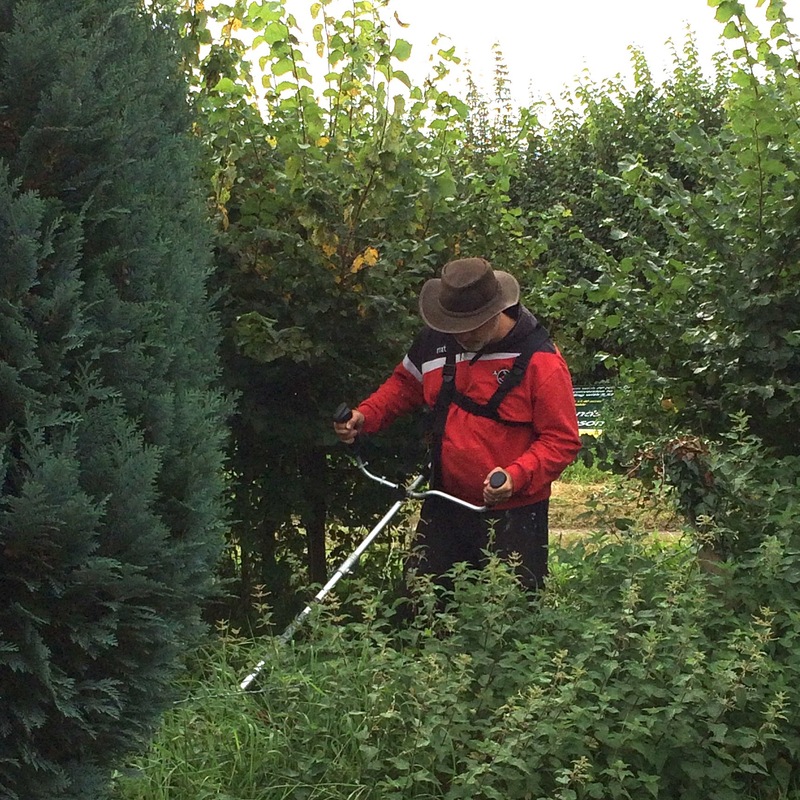 Mr H-L bought a new toy brush cutter and went straight out to play with it. 14. 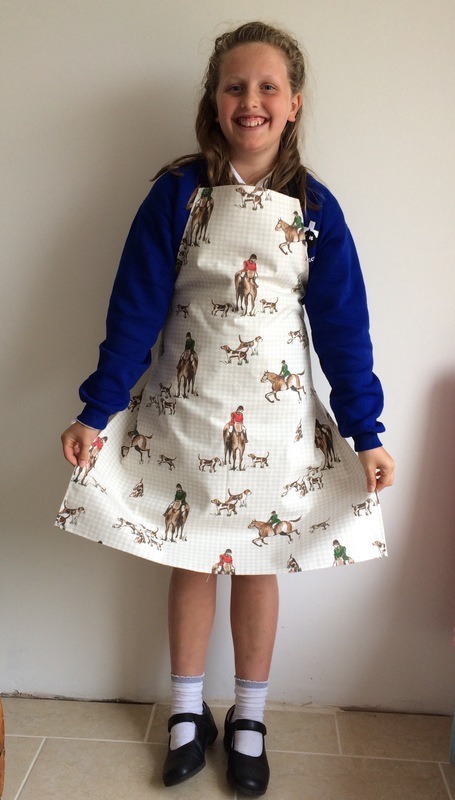 Sewing classes re-started this week and one of my students made this fabulous apron, destined to be a Christmas present for her Auntie. 15. 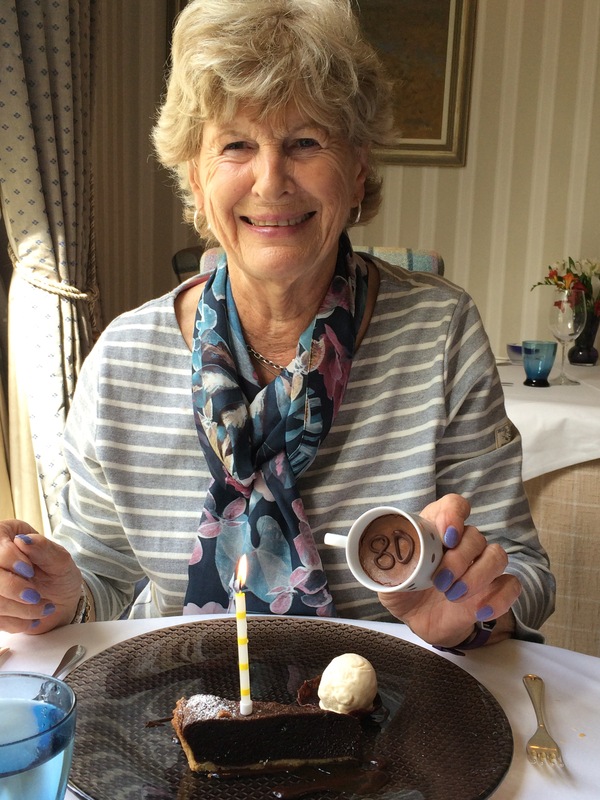 Another of our good friends turned Eighty this week, so we took her out for lunch to celebrate. Little Barwick House – just lovely. 16. 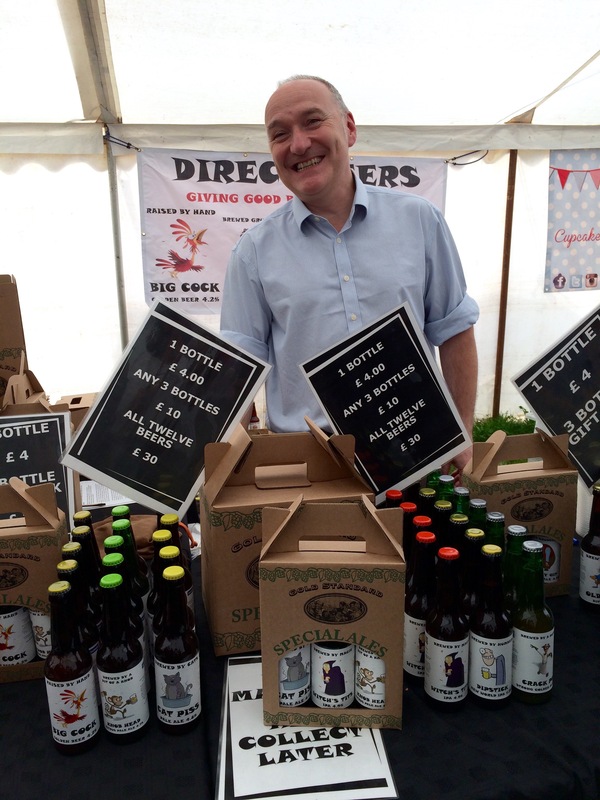 We went with some friends to Frome Cheese and Agriculture Show where we bought some interesting Christmas presents. 17. As well as all the animal shows…..
19. 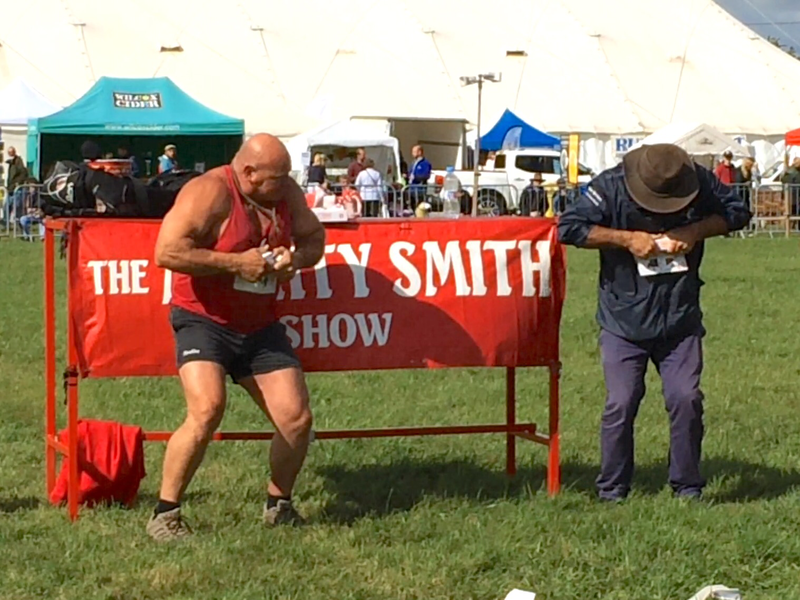 ….hubby was plucked out of the crowd to humiliate himself in the Strong Man tear-an-Argos-catalogue-in-half competition! 20. 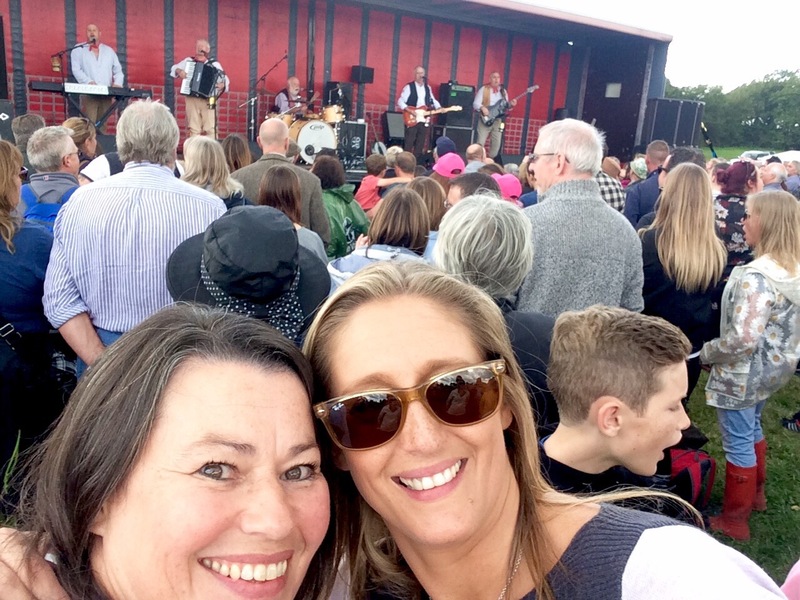 By far the highlight of the day though, was singing along to The Wurzels. Such a lovely bunch of blokes, one of them is now in his Eighties! 21. 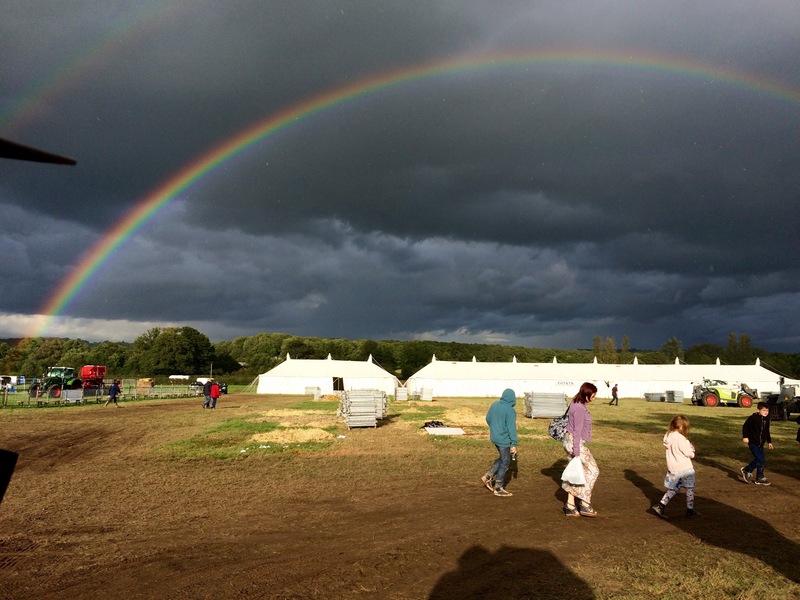 Just as we were leaving the showground, the skies blackened and a full, double rainbow appeared. We made it back to the car before the heavens opened. 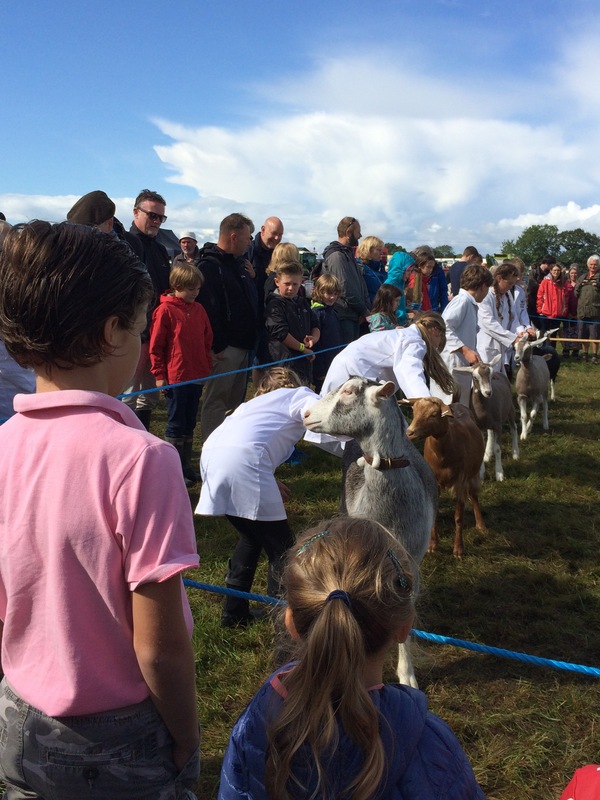 Categories: Sunday Sevens | Tags: Frome show | Permalink. Wow! what a week – your 80 year old friend looks so happy and sprightly – love her nail varnish – I hope I look as youthful and vibrant at her age. So glad Number 2 son is enjoying himself. 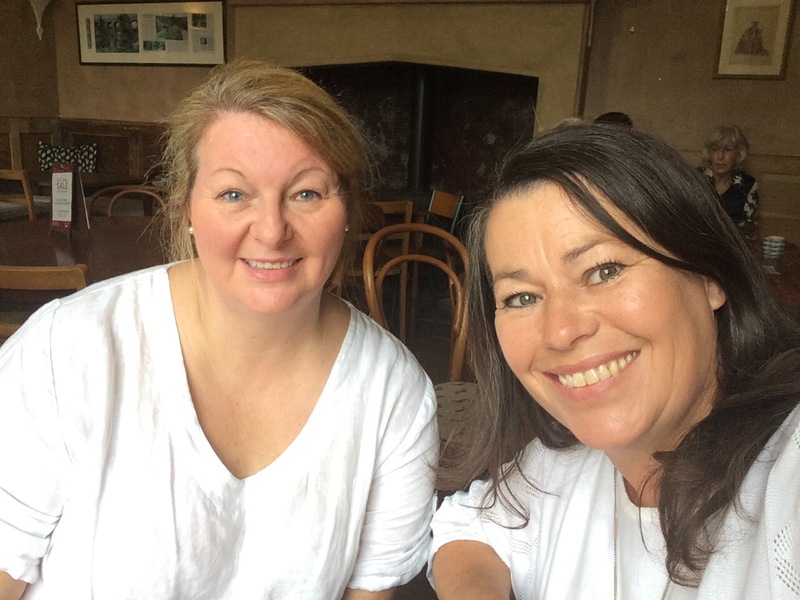 My kids all went to boarding school – not my choice but they were all mad keen on sport and it seemed the best for them – they all LOVED it and still rave about their time there. All three, now in 40s and late 30s still keep in touch with their school friends – life-long bonds. That rainbow! – brilliantly caught on camera. I can understand your feelings, it was a horrible day for me when I took my first son to stay at the school. Such a relief to see him and know how happy he was. No mobiles in those days! So glad to know your son has made such a good start. I boarded my last year at school as my parents divorced when I was half way through A levels, and couldn’t move schools. I loved it, and besides he supports Spurs ( oldest son has a season ticket, it’s character building supporting Spurs). He will be so grown up when you see him next. Name tapes, always best to sew isn’t it as they will come off in the wash. I bet number 3 misses him. I like the apron your pupil did, the children are doing so well. Grand day in Frome, such a lovely town. You’re welcome, glad you enjoyed them! Will #3 miss #2 terribly? Your boys always seem so close and companionable……… Your friend is a beautiful example of what 80 can look like – she will be my inspiration for the next decade 🙂 And of course your photo of the glowering sky and double rainbow is an excellent capture of the moment. How did your husband get on with the Argos catalogue? That was a big bloke he was stood next to! 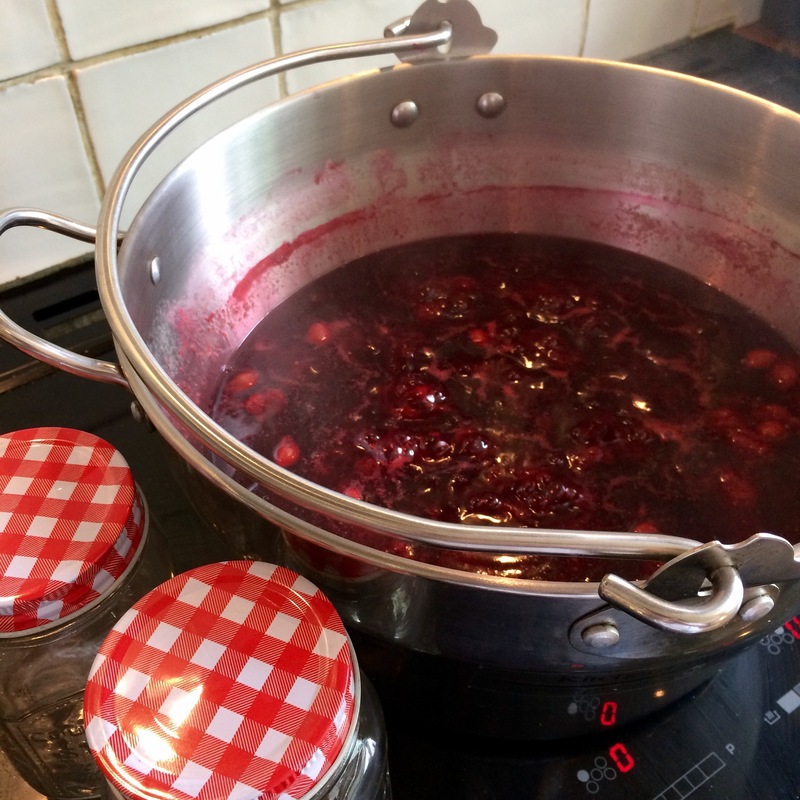 I like the look of your damson jam – I’ve not made that one before. We’ve been making plum and vanilla jam, and rhubarb and ginger jam. We’ve got so much of the stuff we can’t give it away! Did you see the word ‘Humiliation’ in that sentence? That’s how he got on! 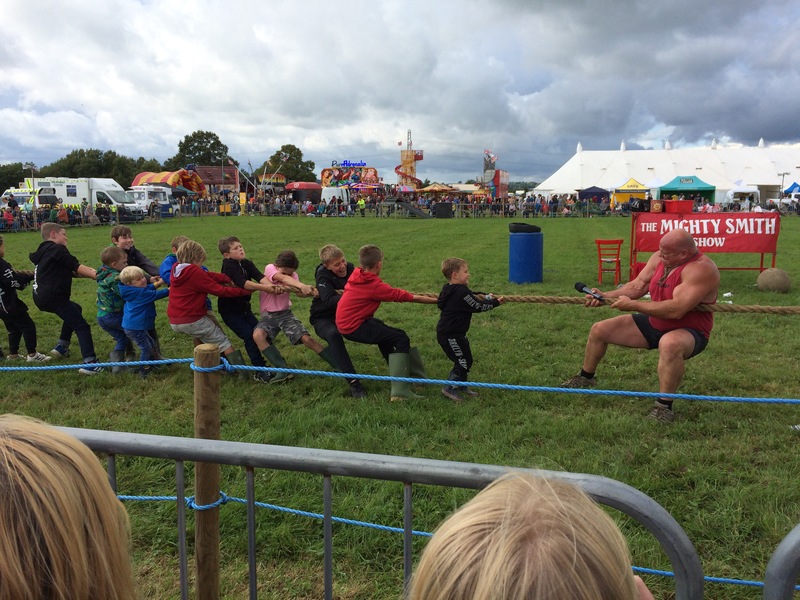 The big bloke was the strong man running the sideshow. I’ve also made rhubarb and ginger jam, the blackberry and apple is next. Plum and vanilla sounds lovely! Lovely rainbow in an otherwise very scary looking sky. Well, he’s got goggles and shin pads on but, as you say, men are always a bit cavalier about such things! A lovely and busy week with so much happening. Sorry to hear the boys were not well, but it seems that they are over the worst. 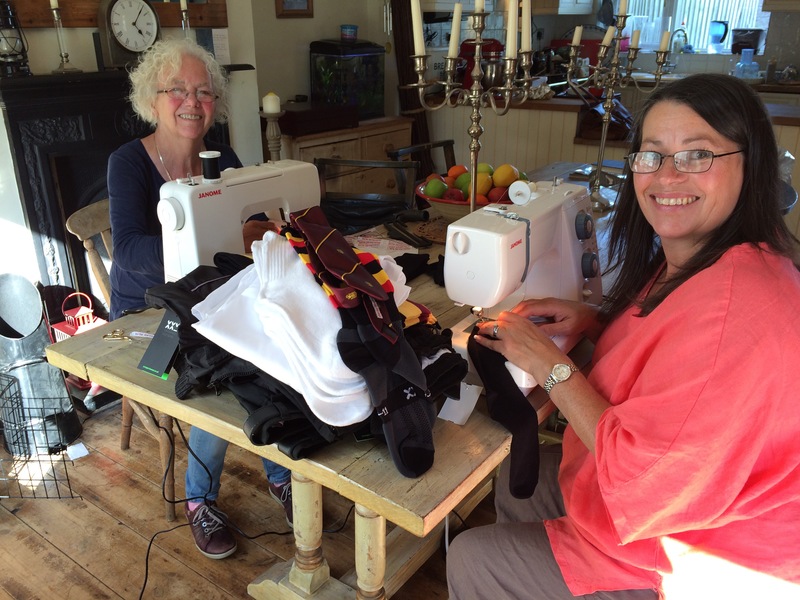 Lots of lovely shopping and sewing as well. 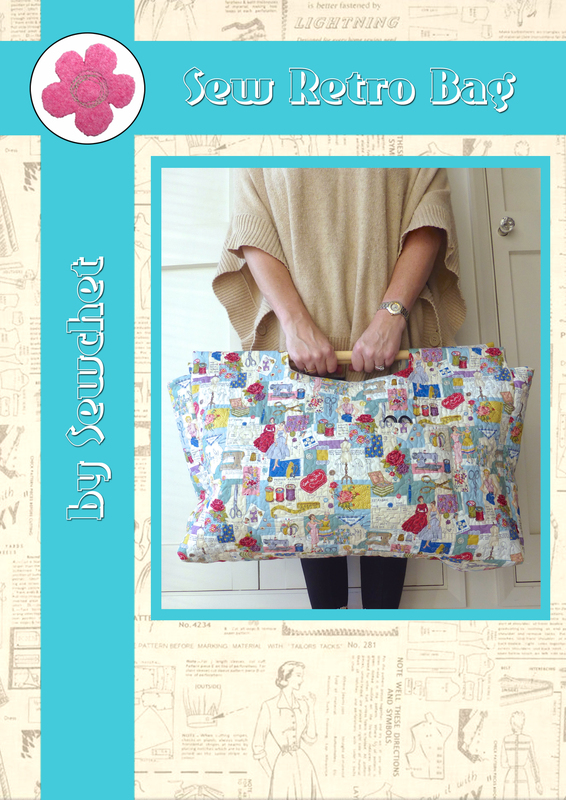 I like the fabric your student used, it is lovely. Love the Christmas presents too, a must have for sure. And indeed, those are very small wine bottles. Glad you got to the car before that storm let loose, it looked very dark and ominous. If nothing else, doing Sunday Sevens shows me how busy we’ve been! 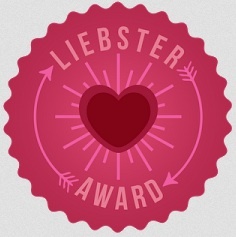 It’s amazing when you look back to see what you’ve achieved in a week. Too quiet without No.2 Son, though, so it’s nice to be back teaching as it’s a bit of a distraction. That is very true. 🙂 One hardly realized just how much you do in a week. Hope No 2 Son gets to visit soon. 🙂 I am sure it is very quiet. My Son in Law is in Europe for 2 months now, and we miss him just as much. Just another week, and he is heading home. At last. Another lovely week (with the exception of the sticky bug ). Your photos are lovely, and the rainbows are exceptional. Is it possible to get triple rainbows? Do you know what, I have no idea if there are triple rainbows, although it is now my mission to find one! They look all the more spectacular against a black sky, don’t they? I can’t get over how grown up no 2 is! And how young your 80 year old friend! I think I need to move your way and breathe in all that fresh air!